According to the 2005 Dietary Guidelines for Americans, people should eat two servings of fish per week (about 8 oz in total) to help reduce their risk of mortality from coronary heart disease. The American Heart Association concurs and additionally recommends at least 1,000 mg of EPA and DHA per day for those with documented coronary heart disease. The association adds that the preferred source is fish. Of course, vegetarians do not eat fish or seafood. 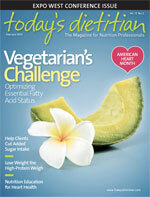 Not surprisingly, their blood and tissue levels of EPA and DHA are about one half of nonvegetarians.1 Considering the evidence for negative health outcomes associated with reduced omega-3 fatty acid status, it makes sense for dietitians to assist vegetarian and vegan clients in constructing diets that optimize omega-3 fatty acid status. When fish and eggs are eliminated from the diet, few direct sources of highly unsaturated omega-3 fatty acids remain. Therefore, vegetarians predominately rely on the conversion of the essential fatty acid (EFA) alpha-linolenic acid (ALA) from plants to supply EPA and DHA. There is evidence that the conversion is significantly better in young women than in men.4,5 One study found that young women converted 21% of ALA to EPA, 9% to DHA, and 6% to an intermediary highly unsaturated fat called docosapentaenoic acid (DPA).4 This totals a remarkable 36% of ALA that was converted to highly unsaturated fatty acids. In men, the conversion was 8% for EPA, 0% for DHA, and 8% for DPA, bringing the total conversion to 16%.5 The high conversion rates reported in young women are most likely nature’s way of preparing for the increased needs of pregnancy and lactation, as DHA is necessary in the formation and development of the brain, nervous system, and retina of a fetus/newborn. The obvious question is whether the conversion process provides adequate EPA and DHA for optimal health or just enough to avoid deficiency. Scientists do not have conclusive evidence that vegetarians’ health status would be improved with more direct sources of highly unsaturated fatty acids. However, incorporating direct sources of EPA and DHA may be worth considering, particularly for those with increased needs (eg, pregnant and lactating women) and those who are at greater risk of poor conversion (eg, people with diabetes or hypertension, those with neurological disorders, premature infants, older adults). While it’s not common, it is possible to overconsume omega-3 fatty acids. If a person minimizes omega-6 fatty acids and uses large amounts of omega-3–rich oils such as flaxseed oil, the resulting ratio of omega-6 to omega-3 could be less than 1:2, which could result in an insufficient conversion of LA to AA. In extreme cases, it could lead to omega-6 deficiency, characterized by skin problems, dry eyes, dry hair, poor wound healing, and increased susceptibility to infection. To ensure a healthful balance of EFAs and their derivatives, vegetarians need to adjust their dietary intake to ensure optimal conversion of ALA to EPA and DHA; in some cases, they may wish to add a direct source of EPA and DHA. Balancing EFAs is not so difficult when the fat sources are recognized. Among plant foods, the primary sources of saturated fat are coconut and tropical oils. Avocados, nuts (except for butternuts, pine nuts, and walnuts), olives, olive oil, and canola oil are concentrated sources of monounsaturated fat. Seeds and seed oils are the principal sources of polyunsaturated fat. Grains, fruits, legumes, and vegetables are generally very low in fat, so they make fairly minor contributions. The fat in grains is largely omega-6 fatty acids, while greens provide mostly omega-3 fatty acids. Legumes and fruits contain mainly polyunsaturated fat, with some being higher in omega-6 fats and others in omega-3 fatty acids. Excluding extremes (eg, chickpeas, which are mainly omega-6), most legumes average a ratio of omega-6s to omega-3s of about 2:1. The average ratio for fruit rests between 1:1 and 2:1, with apples at about 5:1 and papaya about 1:5. To achieve the best possible EFA status on a vegetarian diet, it must be nutritionally adequate, meeting the Dietary Reference Intakes for all nutrients. For some individuals, nutritional supplements will be indicated. 1. Limit total fat intake, avoid trans fatty acids, and reduce saturated fats. High total, trans, and saturated fats can all depress desaturase enzymes. To limit total fat intake, use added fats and oils sparingly. Avoid processed foods containing partially hydrogenated vegetable oils or shortening. Limit intake of full-fat dairy products (for lacto-vegetarians) and intake of tropical oils. 2. Make monounsaturated fatty acids the primary dietary fat. Approximately one half of dietary fat should be monounsaturated, unless the diet contains less than 15% of calories from fat. In this case, polyunsaturated fats should be predominant to meet EFA needs. The most concentrated sources of monounsaturated fats are avocados, nuts, olives, olive oil, canola oil, and high-oleic sunflower and safflower oils. If oils are used in cooking, it is generally best to stick to monounsaturated-rich oils such as olive oil and canola oil. This automatically puts a lid on omega-6 fatty acids. Table 1 provides a list of high-fat foods and their relative fatty acid composition. 3. Include good sources of ALA (omega-3 fatty acids from plants) daily. The richest sources of ALA are seeds (chia seeds, flaxseeds, flaxseed oil, hempseeds, hempseed oil) and walnuts. Aim for at least 2.2 to 4.4 g/day on a 2,000-kcal diet. While most of the fat in leafy greens is omega-3, the total fat content is very low. So to get 1 g of ALA from greens, you would need to eat about 10 cups. Flaxseeds are a rich and economical source of omega-3 fatty acids. However, they tend to go through the intestinal tract undigested if they’re not ground. While whole flaxseeds do a great job of increasing stool bulk, ground flaxseeds provide a much more reliable source of omega-3 fatty acids. (See Table 2 for the EFA content of selected plant foods.) Omega-3 fatty acids such as flaxseed oil and hempseed oil are excellent choices for salad dressing; however, they should not be exposed to direct heat. While chia seeds are also a rich source of omega-3, they are significantly more expensive than flaxseeds. 4. Reduce intake of omega-6 fatty acids, if excessive. It is easy to overdo omega-6 fatty acids, especially when omega-6–rich oils such as corn, grapeseed, safflower, sesame, and/or sunflower oil are used as the primary cooking oils. Seeds that are low in omega-3 fatty acids, such as pumpkin, sesame, and sunflower seeds, can also boost omega-6 fatty acid intake significantly. One ounce of omega-6–rich seeds provides 6 to 9 g of omega-6 fatty acids. Recall that the target is 4% to 8% of calories from LA, so in a 2,000-kcal diet, the upper limit for omega-6 fatty acids would be about 18 g. Of course, if energy intake is higher, the upper limit for omega-6 intake would increase proportionally. For example, on a 2,800-kcal diet, the upper limit for omega-6 fatty acids would be 25 g. While the fats from most avocados and nuts are mainly monounsaturated, those foods contain far more omega-6 than omega-3 fatty acids and do contribute to omega-6 intakes. The best way to ensure that omega-6 fatty acids are kept under control is to avoid omega-6–rich oils and keep intake of omega-6–rich seeds to about 1 oz per day. 5. Consider a direct source of EPA and DHA. The only plant sources of long-chain omega-3 fatty acids are plants from the sea—sea vegetables and microalgae (which are consumed and concentrated by fish). Sea vegetables are even lower in fat than most land vegetables, although they do contain small amounts of highly unsaturated omega-3 fatty acids. A 100-g serving provides, on average, about 100 mg of EPA but little DHA. Sea vegetables do not contribute significantly to EPA intakes in the Western world, but they are significant sources in countries where people use large quantities of sea vegetables on a daily basis (such as Japan and other parts of Asia). Some sea vegetables may provide too much iodine if they are consumed in excessive quantities. Vegetarians enjoy many health advantages, and these benefits are related, at least in part, to a more favorable intake of fats and oils. Vegetarians eat less fat overall and consume less damaging saturated fats, cholesterol, and trans fatty acids. However, vegetarian diets appear to offer no advantages over omnivorous eating patterns regarding EFA balance and intake. Indeed, it has been suggested that vegetarians could be at a disadvantage, as plant sources of omega-3 fatty acids are limited and vegetarian diets are lacking in direct sources of long-chain omega-3 fatty acids (EPA and DHA). Dietitians can play a key role in helping vegetarians achieve optimal health by ensuring an adequate intake and balance of EFAs. — Brenda Davis, RD, is an author, an international speaker, and the lead dietitian on a diabetes intervention project in Majuro, Marshall Islands. She specializes in vegetarian/vegan nutrition and lifestyle-related diseases. 1. Davis BC, Kris-Etherton PM. Achieving optimal essential fatty acid status in vegetarians: Current knowledge and practical implications. Am J Clin Nutr. 2003;78 (3 Suppl):640S-646S. 2. Gerster H. Can adults adequately convert alpha-linolenic acid (18:3 n-3) to eicosapentaenoic acid (20:5 n-3) and docosahexaenoic acid (22:6 n-3)? Int J Vit Nutr Res. 1998;68(3):159-173. 3. Das UN. Essential fatty acids: Biochemistry, physiology, and pathology. Biotechnol J. 2006;1(4):420-439. 4. Burdge GC, Wootton SA. Conversion of alpha-linolenic acid to eicosapentaenoic, docosapentaenoic and docosahexaenoic acids in young women. Br J Nutr. 2002;88(4):411-420. 5. Burdge GC, Jones AE, Wootton SA. Eicosapentaenoic and docosapentaenoic acids are the principal products of alpha-linolenic acid metabolism in young men. Br J Nutr. 2002;88(4):355-363. 6. Indu M, Ghafoorunissa. n-3 fatty acids in Indian diets—comparison of the effects of precursor (alpha-linolenic acid) vs product (long-chain n-3 polyunsaturated fatty acids). Nutr Res. 1992;12:569-582. 7. Masters C. Omega-3 fatty acids and the peroxisome. Mol Cell Biochem. 1996;165(2):83-93. 8. Harnack K, Andersen G, Somoza V. Quantitation of alpha-linolenic acid elongation to eicosapentaenoic and docosahexaenoic acid as affected by the ratio of n6/n3 fatty acids. Nutr Metab (Lond). 2009;6:8. 9. Doughman SD, Krupanidhi S, Sanjeevi CB. Omega-3 fatty acids for nutrition and medicine: Considering microalgae oil as a vegetarian source of EPA and DHA. Curr Diabetes Rev. 2007;3(3):198-203. 10. Kusbak R, Drapeau C, van Cott E, Winter H. Blue-green algaaphanizomenon flos-aquae as a source of dietary polyunsaturated fatty acids and a hypocholesterolemic agent. Presented at: Annual Meeting of the American Chemical Society; March 21-25, 1999; Anaheim, Calif.
11. U.S. Department of Agriculture Agricultural Research Service. USDA national nutrient database for standard reference, release 21.2008. Available at: http://www.nal.usda.gov/fnic/foodcomp/search. Accessed November 2009. 12. Sanders T, Lewis F. Review of nutritional attributes of good oil (cold pressed hemp seed oil). King’s College London Nutritional Sciences Division. 2008. Available at: http://www.goodwebsite.co.uk/kingsreport.pdf. Accessed November 2009. Correction for Table 1: The ALA content of the listed foods should be expressed in grams, not milligrams. Also, following USDA data, the flaxseed ALA figures should read as follows: foaxseed oil: 7.2 g; flaxseeds, whole: 4.8 g; and flaxseeds, ground: 3.2 g.